Book Description: Daw Books, New York, New York, U.S.A., 2011. Hardcover. Book Condition: New. Dust Jacket Condition: New. Nathan Taylor (illustrator). 1st Edition. 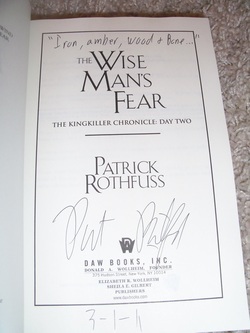 Signed, lined with a quote and dated by Patrick Rothfuss - signed and dated by Nathan Taylor (cartographer for this book, and artist for Rothfuss' "The Adventures of the princess and Mr Whiffle"). Signed at the US launch event, numbers are extremely limited. ​Synopsis : My name is Kvothe. I have stolen princesses back from sleeping barrow kings. I burned down the town of Trebon. I have spent the night with Felurian and left with both my sanity and my life. I was expelled from the University at a younger age than most people are allowed in. I tread paths by moonlight that others fear to speak of during day. I have talked to Gods, loved women, and written songs that make the minstrels weep. You may have heard of me" So begins the tale of a hero told from his own point of view ¿ a story unequaled in fantasy literature. Now in THE WISE MAN¿S FEAR, Day Two of The King-killer Chronicle, an escalating rivalry with a powerful member of the nobility forces Kvothe to leave the University and seek his fortune abroad. Adrift, penniless, and alone, he travels to Vintas, where he quickly becomes entangled in the politics of courtly society. While attempting to curry favor with a powerful noble, Kvothe uncovers an assassination attempt, comes into conflict with a rival arcanist, and leads a group of mercenaries into the wild, in an attempt to solve the mystery of who (or what) is waylaying travelers on the King's Road. All the while, Kvothe searches for answers, attempting to uncover the truth about the mysterious Amyr, the Chandrian, and the death of his parents. Along the way, Kvothe is put on trial by the legendary Adem mercenaries, is forced to reclaim the honor of the Edema Ruh, and travels into the Fae realm. There he meets Felurian, the faerie woman no man can resist, and who no man has ever survived . until Kvothe. In THE WISE MAN¿S FEAR, Kvothe takes his first steps on the path of the hero and learns how difficult life can be when a man becomes a legend in his own time. From Publishers Weekly : As seamless and lyrical as a song from the lute-playing adventurer and arcanist Kvothe, this mesmerizing sequel to Rothfuss' 2007's debut, The Name of the Wind, is a towering work of fantasy. As Kvothe, now the unassuming keeper of the Waystone Inn, continues to share his astounding life story ¿ a history that includes saving an influential lord from treachery, defeating a band of dangerous bandits, and surviving an encounter with a legendary Fae seductress¿he also offers glimpses into his life's true pursuit: figuring out how to vanquish the mythical Chandrian, a group of seven godlike destroyers that brutally murdered his family and left him an orphan. But while Kvothe recalls the events of his past, his future is conspiring just outside the inn's doors. This breathtakingly epic story is heartrending in its intimacy and masterful in its narrative essence, and will leave fans waiting on tenterhooks for the final installment. Signed by Author and Illustrator.